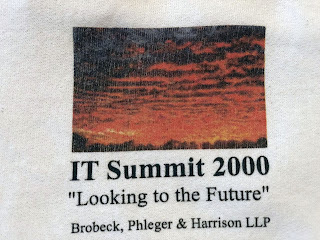 Beginning with my time in-house at Brobeck (1998-2002), I have enjoyed writing about Legal Technology for many publications. Many reprints were available on earlier versions of the Litigation-Tech website. After some updates and upgrades over the years, these had become "orphaned," meaning they were still available online, but could only be found by running a specific web search. As a Holiday project, I decided to set them up in an archive, so they would be available once again. Although these articles are somewhat "dated," many of them are still surprisingly relevant. The archive is intended to preserve these older articles, which were written prior to the Court Technology and Trial Presentation blog, which I started writing in 2009. Things are different for writers now, in that you can click, and publish. Back in the day, you'd write, submit to the publication editor, get change-requests, edit and submit updated version(s), and then wait for several weeks to finally see it arrive in print. I still have a big bunch of published print-media articles in my bookcase. It's hard to say which is more enjoyable from the author's perspective, although quick edits or changes are easy online - not so much when you were limited to reading it on paper. With that introduction, here are links to the archive, with a few notes on what you can find at each one. I truly hope you appreciate it. Articles Archive Contents - This is sort of a directory, although not all-inclusive. Many links are here with brief descriptions. Lit-Support - In-House or Outsource?